My long blonde locks require extra special treatment in the weeks following a trip to the hairdressers, as I hope to prevent the colour from fading so quickly. 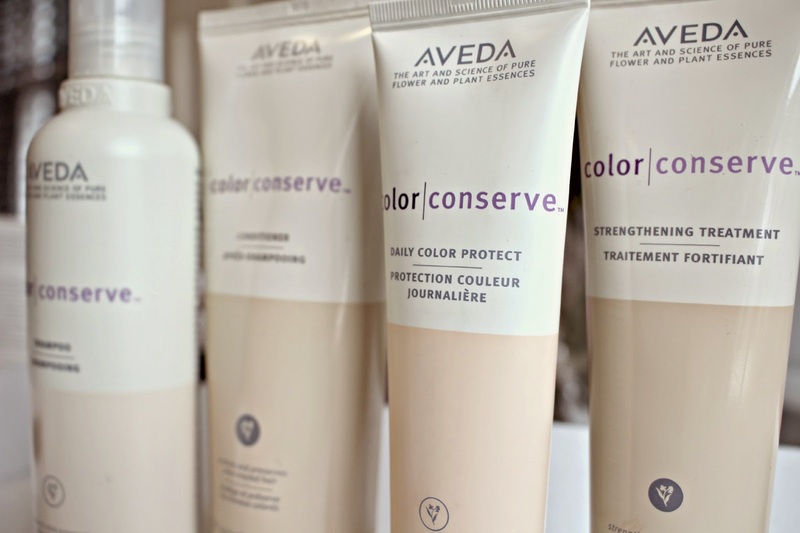 For the last month or so, I’ve been trying out Aveda’s Colour Conserve range which includes the Colour Conserve Shampoo, Conditioner, Strengthening Treatment, and Daily Colour Protect. I find that after all the chemicals that are needed to get the blonde colour, I’ve been wanting to avoid harsher shampoos and have been regularly indulging in hair masques and treatments in a bid to keep it looking healthy and glossy. I think that using the Aveda Colour Conserve products above all else has helped to prolong the colour that you get when you are ‘fresh from the hairdressers’. I adore the Mocha shade toner that my hair dresser uses, and using this collection meant that that shade has lasted even 6 weeks after my treatment, usually it would fade within a fortnight. The Aveda Colour Conserve Shampoo gives a real good lather so you only need to apply an amount the size of a ten penny piece, and the formula also protects your hair from sun, water and environmental damage so its also ideal for taking away on holiday. The Colour Conserve Conditioner nourishes the ends of your hair to protect breakage from colour – damaged hair, but when my hair is really dry, I reach for the Colour Conserve Treatment. I leave it on for 5 minutes while I exfoliate, and the flower and plant essences act as a rescue remedy for my weak hair. It adds strength and moisture and my hair is noticeably more manageable after I use it. The final product which I use is the Colour Conserve Daily Colour Protect – it’s a leave in treatment which locks in the colour and keeps your hair looking glossy and healthy. You can skin conditioner if you use this, but I usually like to comb some conditioner through the tips as well. Overall this is a lovely range and an essential, especially for blondes, if you want to cut down those trips to the hairdresser when your colour starts to fade or go brassy. If I had to pick one product from the range, it would be the Colour Conserve Treatment because I think the results that this gives are the most noticeable. You can buy the Shampoo, Conditioner and Strengthening treatment Trio from LookFantastic.com here for £50.55, and also all the products are available to buy separately there too. Have you tried any colour-prologinging haircare?